In the preparation below, a little goes a long way. SInce you will be cutting into thin strips and serving with tortilla and topping you will probably have plenty for 4. A skirt steak is the diaphragm muscle and is used to make many Mexican dishes fajita being one of them,Tequila Fajita being one of our favorites. We make this dish many ways but basicall there is citrus, tequila and oil. You can fix it up any way you like, we certainly have over the years. Lay the skirt steak flat on your cutting board and trim off the silvery skin. You can leave as much fat as possible as it adds great flavor to the skirt steak when cooking. You can always trim the fat later, after it cooks. With a sharp knife, score the meat about one inch apart diagonally across the grain making a diamond pattern. You want to just cut into the surface of the meat and not cut through it. Do this on both sides. 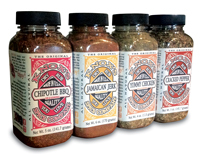 Mix together the marinade ingredients. 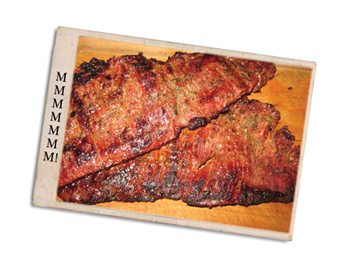 In a zip lock bag or sealable plastic container add the skirt steak and pour in the marinade. Massage or flip to make sure the marinade is getting on all of the skirt steak. Let sit for at least 1 hour, up to 4 hours refrigerated. Now that you have slices of perfectly cooked, tequila marinated, skirt steak you need to assemble it. Toast tortilla and keep in a warm damp towel. Lay the tortilla flat on your plate. Add sliced skirt steak down the center leaving room at the ends for folding. Top withyour favorite ingredients. You are in for a treat! Serve with a beverage of your choosing.